Below is an excerpt from “And the Good News Is…: Lessons and Advice from the Bright Side” by Dana Perino. Reprinted by permission of Twelve Books (c) 2015. President George W. Bush meets with U.S. Army Specialist Salvatore Cavallaro while visiting troops at Walter Reed Army Medical Center. 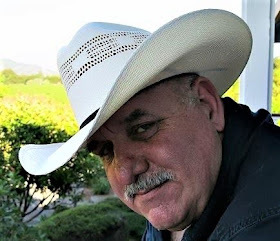 News of America’s military men and women were wounded and killed in Iraq and Afghanistan almost overwhelmed me on some days. I may have sounded strong when I was talking to the press, but sometimes I had to push my feelings way down in order to get any words out of my mouth to make statements and answer questions. 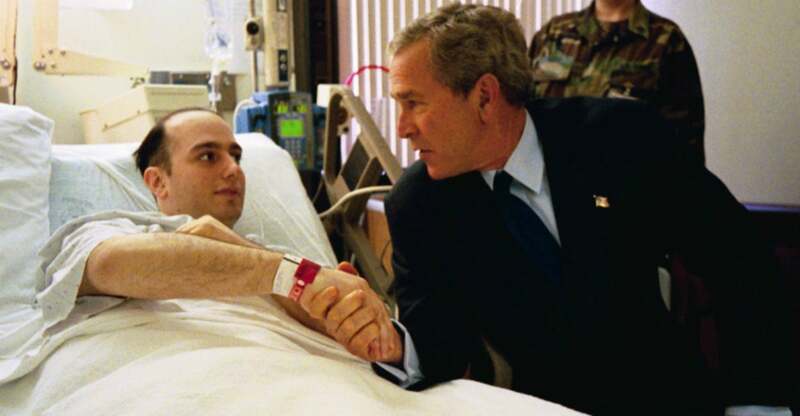 The hardest days were when President Bush went to visit the wounded or families of the fallen. If it was tough for me, you can only imagine what it was like for the families and for a president who knew that his decisions led his troops into battles where they fought valiantly but were severely injured or lost their lives. 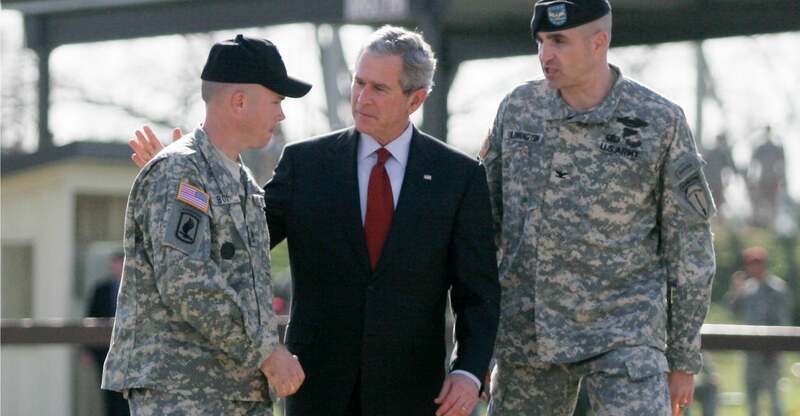 George W. Bush talks with soldiers at Fort Benning, Ga. in 2007. 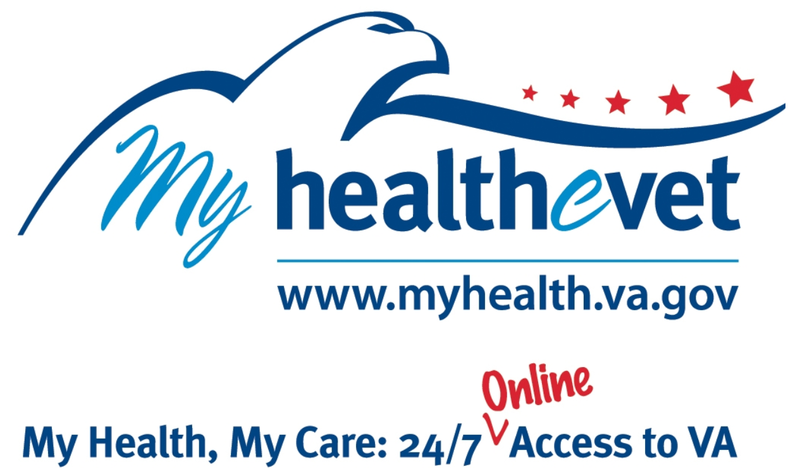 He regularly visited patients at Walter Reed military hospital near the White House. These stops were unannounced because of security concerns and hassles for the hospital staff that come with a full blown presidential visit. One morning in 2005, Scott McClellan sent me in his place to visit the wounded warriors. 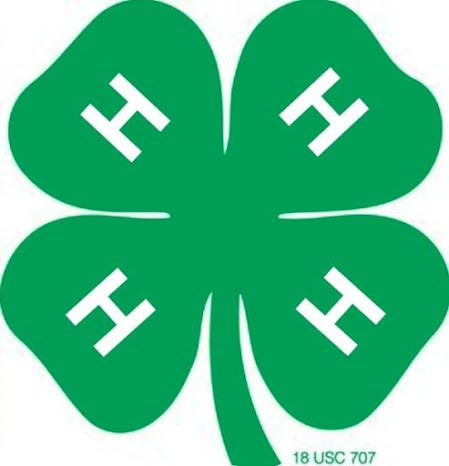 It was my first time for that particular assignment, and I was nervous about how the visits would go. The president was scheduled to see twenty-five patients at Walter Reed. Many of them had traumatic brain injuries and were in very serious, sometimes critical, condition. Despite getting the best treatment available in the world, we knew that some would not survive. 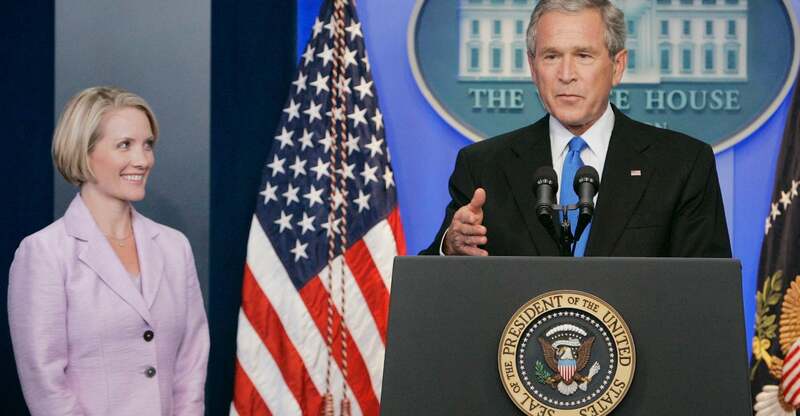 George W. Bush announces that Dana Perino will take over the post of White House Press Secretary in 2007. We started in the intensive care unit. The Chief Naval Officer (CNO) briefed the president on our way into the hospital about the first patient we’d see. He was a young Marine who had been injured when his Humvee was hit by a roadside bomb. After his rescue, he was flown to Landstuhl U.S. Air Force Base in Kaiserslautern, Germany. At his bedside were his parents, wife, and five-year-old son. The military aide presented the Marine with the award for a second time. The president had tears dripping from his eyes onto the Marine’s face. 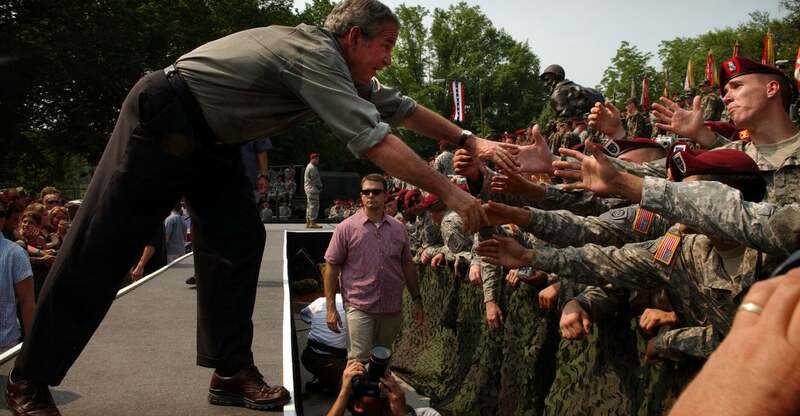 George W. Bush shakes hands with soldiers after finishing his speech July 4, 2006, during his visit to Fort Bragg, N.C. The soldier was intubated. The president talked quietly with the family at the foot of the patient’s bed. I looked up at the ceiling so that I could hold back tears. After he visited with them for a bit, the president turned to the military aide and said, “Okay, let’s do the presentation.” The wounded soldier was being awarded the Purple Heart, given to troops that suffer wounds in combat. 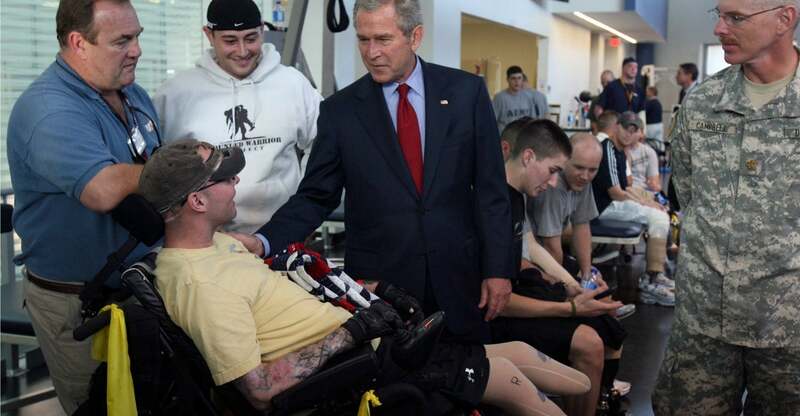 George W. Bush visits with Army Sgt. Nicholas McCoy at the Center for the Intrepid at Brooke Army Medical Center in San Antonio. So we stood silently as the military aide presented the Marine with the award for a second time. The president had tears dripping from his eyes onto the Marine’s face. As the presentation ended, the president rested his forehead on the Marine’s for a moment. And that was just the first patient we saw. For the rest of the visit to the hospital that day, almost every family had the same reaction of joy when they saw the president. 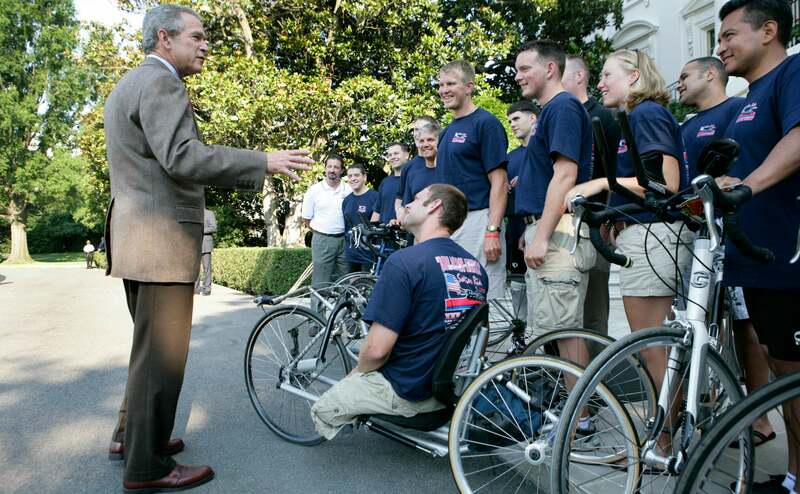 George W. Bush speaks with members of Soldier Ride 2005 National Tour Team. Soldier Ride 2005, comprised of wounded service members, is a 4,200-mile, cross-country bike ride to raise money and support to help prepare wounded soldiers for long-term rehabilitation. But there were exceptions. One mom and dad of a dying soldier from the Caribbean were devastated, the mom beside herself with grief. She yelled at the president, wanting to know why it was her child and not his who lay in that hospital bed. Her husband tried to calm her and I noticed the president wasn't in a hurry to leave—he tried offering comfort but then just stood and took it, like he expected and needed to hear the anguish, to try to soak up some of her suffering if he could. Later as we rode back on Marine One to the White House, no one spoke. One tear slipped out the side of his eye and down his face. He didn’t wipe it away, and we flew back to the White House. 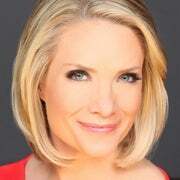 Dana Perino served for seven years in the administration of President George W. Bush and became the first Republican woman to be named as the White House press secretary. 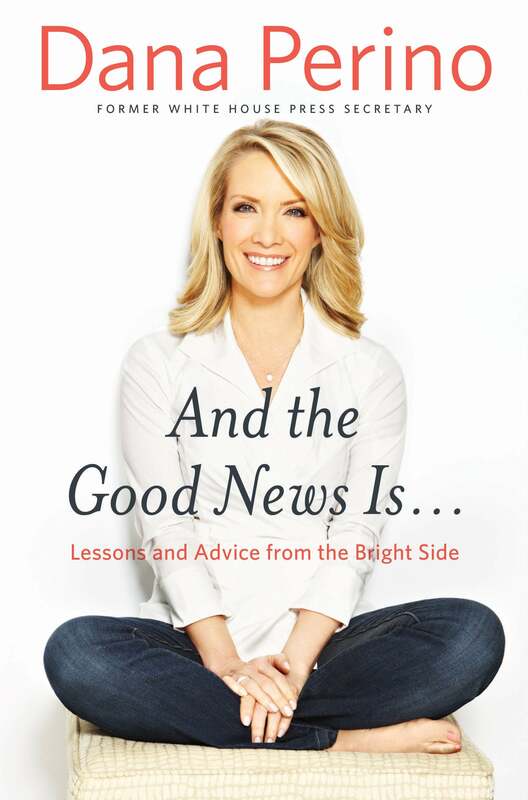 She is a Fox News contributor and one of the co-hosts of "The Five," and the author of "And the Good News Is: Lessons and Advice from the Bright Side." I have just ordered her book, I hope that you do too.